Several months ago, I got up at 5:30 in the am and headed out for a frigid sunrise photoshoot downtown. I wasn’t quite sure where I was headed, but I parked near the Tidal Basin and ended up across from the Jefferson Memorial just as a hint of light started appearing on the horizon. This was only my second trek out since I got my new Gitzo GT2541 tripod and Really Right Stuff BH-55 ballhead, so I quickly assembled my support, and started adjusting my settings. I almost always find myself shooting in Manual mode these days, especially when using a tripod. Otherwise the camera will compensate for the low light with a high ISO and wide open aperture… exactly what you don’t want when you’re looking for tack sharp shots and have an excellent support system. As usual, I wanted ISO 100 with an aperture of at least f/8. If you’re not familiar with Manual settings, then the quick explanation is this… the lowest ISO gives you the least amount of noise, while the “sweet spot” for sharpness with most lenses falls around f/8 to f/11. Even though I shoot with an EF 24-70 f/2.8 L lens, shooting at f/2.8 would give me way too shallow depth of field for a “tack sharp” landscape shot. At any rate, the only variable left was shutter speed, and with a great tripod, that could be as long as I wanted. All set up and ready to shoot. Sunrise over Washington DC and Jefferson Memorial, reflected in the Tidal Basin. Sunrise over the Washington Monument as it reflects in the Tidal Basin. A stunning pink and yellow sunrise behind the Jefferson Memorial. 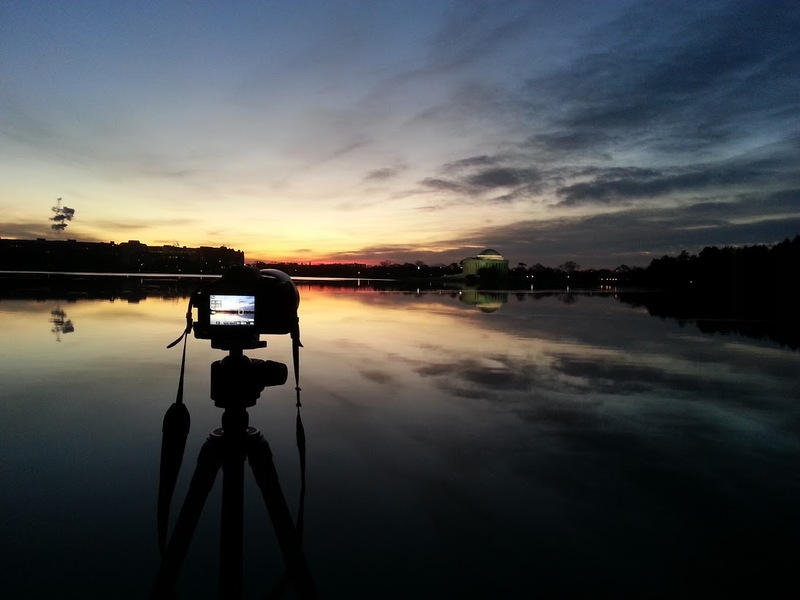 A 60 second long exposure with a to stop ND filter at the Tidal Basin. Hope you enjoyed. Looking to many more early morning trips out this year. Now that you’re done reading, take a look at my complete Washington DC Photography gallery at my Andrew Rhodes Photography website. The entire gallery for this shoot can be found at my Flickr account.